Thank you for writing these books. I am really enjoying how you are intertwining the three series! It’s great to see the other characters peeking into each new book. Great read. Love to learn about other countries. This was another great read. Lots of suspense and intrigue. Love to learn about other countries. Can't wait to read the next one. What a Knock Out Series! Military Romantic Suspense is not a new genre but this series has an intriguing new slant, at least for me. While serving in Afghanistan, the truck the 8-man unit were riding in was blown up by an anti-tank roadside mine. One casualty and 7 lives blown apart, literally. Now the healing has begun. Four men, Erick, Cade, Talon and Laszlo are on their way back to the accident site for answers with Badger stateside on intel. These men need to put the PTSD demons to rest and the only way is to find out how, who and why their truck was blown up. I love this book! We have the opportunity to read about the difficult journey our soldiers face when they are severely injured while serving our Country. Lost limbs and lost memories are just a couple of the devastating hurdles soldiers have to deal with. In this incredible story, the second in this fabulous series, continues the progress these men have made in finding two year old clues. I love how this whole series is set up. Each surviving man from the accident has lost at least one limb, some multiple limbs, or some body part. After enduring the surgeries and therapy to attempt to put their bodies back together, they now face the memories and lack thereof of the accident itself. Foreign countries that are at war are dangerous to their own inhabitants, but Americans, asking questions about soldiers and bombs is a very questionable venture. Honey, a young, beautiful dentist, finds trouble just because she is seen briefly talking to Erick. Trouble, secrets, and danger around every corner, Erick and his friends need to keep Honey safe while also keeping themselves out of the line of fire. This story has it all! Suspense, armed enemies, murder, and the thrill of the chase! 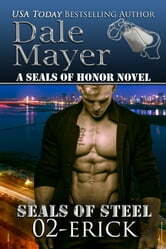 Oh, and there are the hot men of SEALS! We also get the hot, romance between Honey and Erick that is the icing on the cake! A fast paced page turner, this is a must read! Excellent job! I can’t wait for the next book in this series!! Loved it! This is one very interesting story and series. Gets more convoluted as it goes on. A few new ideas here and there and a love story for a happy new warrior.